I don’t think much of an introduction is needed regarding the blackbeard pirates. Their captain Kurohige or Blackbeard, Marshall D Teach, is one of the most interesting villains in One Piece. We first saw him at Mock Town and i must admit it, i became a fun of him after his speech about pirates and people’s dreams. From a nutcase bubbling about dreams there, he went on to recruit one of the most powerful crews, become a Yonkou himself and even acquire two devil fruits(and possibly even more now). The funny thing is he accomplished those feats using his evil ways, and became in our eyes maybe one of the most hated and most promising villains in One Piece. They all look dark and evil. A lot of them are ex prisoners of Impel Down who followed him during the Marineford war. Some others were with him even before that. But who are they really and what are their roles? Lets mention them briefly. Marshall D Teach, Jesus Burgess the helmsman, Shiliew a legendary swordsman, Lafitte, Van Augur the sniper, Doc Q the doctor with his horse Stronger, Sanjuan Wolf, Vasco Shot, Catarina Devon the most dangerous female criminal and Avalo Pizzaro are the current known members. Also, they are somehow affiliated with Ao kiji, though the true nature of that relationship remains a mystery right now. The whole crew’s power seems enormous, especially if someone considers how fearful and legendary the criminals he recruited from Impel Down are supposed to be. Without further ado, lets get to the gist of the article. It is really interesting to see how the blackbeard pirate crew has evolved in the New World. After the Marineford war, Blackbeard showed us an ability we never thought even existed. Maybe with the use of his Yami Yami no Mi or with another way we can only guess about(that’s the purpose of this post), he was able to steal the fruit of the deceased Whitebeard shocking us all. It seems that the whole crew is now stealing devil fruits all over the New World and Teach himself could now possess even more devil fruit powers. The real question is, how do they do it? theory states that the devil fruit of the user who dies, reappeares at the nearest fruit. There are also theories that they appear again randomly in the world or that they appear in the nearest tree not fruit. 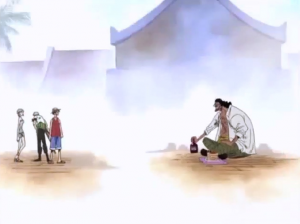 For the purpose of our theory regarding the way the Blackbeards steal devil fruits, we have to assume that the first theory is the correct one. A possible clue to the way the Blackbeards go about stealing devil fruits can come to us if someone noted Jesus Burgess. He has been seen going around with a bag in his hand. It is quite possible to assume that the bag is full with fruits. That way, when a Devil Fruit eater he hunts dies, guess where his devil fruit will appear. Right in Burgess’s bag of fruits. Pretty sick right? We can make some speculations about the reason Teach is able to possess more than one Devil Fruit. Lets start with the obvious, which is his Yami Yami no power. It has been stated that it can draw the power of a devil fruit inside the darkness, but could this be the whole story? I believe some other possibilities also exist. Lets talk about one most of you couldn’t imagine. Blackbeard having one or two parasitic twins living inside of him. It can explain why Luffy and Zoro referred to Teach as “they” back in Mock Town. Is it possible that they noticed that? Also, Marco stated during the war of the best that Kurohige’s body is “atypical”. That way we can all understand how he possesses more than one devil fruit. The parasitic twin(s) has(have) eaten it/them and not Teach himself. How he draws the power in? There is a theory(we can talk about it in more detail in another post), that devil fruits are in actuality souls. That way, when someone who has eaten one dies, the soul of the devil fruit itself leaves his body. After that it occupies the nearest fruit. In that case, Teach with his fruit’s power may be able to draw in the soul of the devil fruit as it exits the dead user’s body and make it his own. He may did that specifically when they covered Whitebeard with the black sheet after he passed away. It is essential to mention one of the most popular theories that exist, that of the Cerberus fruit. Could it be possible that Blackbeard already possessed a fruit before the Yami Yami no Mi? If that is the case, it is quite probable that fruit is the Cerberus fruit. As we know, the Cerberus is a mythical creature with three heads. How about that for an idea? Three heads equal three fruits, the Cerberus one, the Darkness one and the Earthquake one. This can lead to some connections that seem quite fascinating. 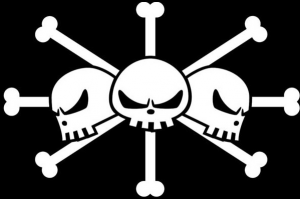 Firstly, the Jolly Roger of the Blackbeard Pirates is three skulls. A coincidence or maybe a well thought out choise for a flag? A second more indirect hint can be the role of the Blackbeards. 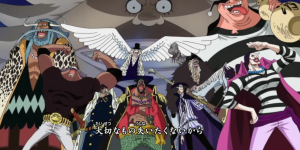 If we assume that they will be the final villains before the last island Raftel, it is quite probable that they indeed have the role of a Cerberus for the Straw Hats. In essence, guarding the gates of hell. What are the ideas we can take away from this post as we wait for the new mangas in order to find out the truth? (Interested in where to read manga? check here). First and foremost, the Blackbeards are insanely powerful in my opinion, probably more than we believe them to be. Secondly, their role is a mystery and the whole story regarding the devil fruits is interesting at the very least. Lastly, there are so many mysteries about the crew that a follow up post seems a necessity :). Great article for any ONE PIECE fan like myself. Weird theories you wrote here. Well done. If the theory that a when a devil fruit user dies, the devil fruit reappears at the nearest fruit, then Burgess carrying a bag of fruits to collect them IS sick! And smart! Do you think that having multiple fruits makes them even “more attractive”? Sort of a cumulative effect? In any case, if, as you suspect, this theory holds up, then the fruits seem to possess some type of “magnetic” property. Good observation! And Teach’s ability to draw the power of a devil fruit may also be some altered version of that same magnetic property? Altered due to his Yami Yami no power? Or do you suspect something else? Oooooooh, interesting notion about the parasitic twins! That is certainly something I did NOT imagine! I’ll have to see how that plays out. And I’m very impressed with your linking of the Cerberus theory with the three skulls of the Jolly Roger of the Blackbeard Pirates! Great analysis and explanation! Now to find out more! Hey Roger, thanks for the comprehensive comment and happy you liked the theory. Cheers! Hey what an awesome niche that you chose! I really like it. My brother is a big one piece fan he watched all 500+ (a while ago) in one week I think, I’ll make sure to show him your site. I come from a big anime fan family and I always wanted to watch one piece but there’s a lottttt of episodes and I have classes all the time haha. But I’m sure I’ll watch it someday. Well Romeo, it could be. What do you think is special about the knife though that makes it possible to steal devil fruits? No problem bro. Well do you believe that Doffy had a special way to know where Ace’s devil fruit would reappear? another thing which can be used to support the cerberus theory is the scar on shank’s left eye. as mentiomed in the great war’s arc, the scar was given by blackbeard, and it looked like it was inflicted by some sort of claw. cerberus is a dog-like creature which attacks using its claws. meaning to say, blackbeard and shank used to clashed and shank was facing blackbeard true form which is the cerberus form. Interesting point. It could hold truth to it. The whole story about Roger‘s crew seems a wonderful one piece mystery that may show things about Buggy, Shanks and Teach that we had never thought about. Not to mention the higher ups of the crew such as Rayleigh and Scopper Gaban. Previous Previous post: One Piece Zoro Eye – Training method or demonic power? Next Next post: Kuina and Tashigi – How are they connected?